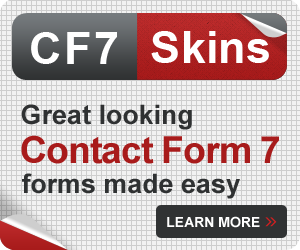 How do I edit a CF7 Skins form (using Contact Form 7 editor)? 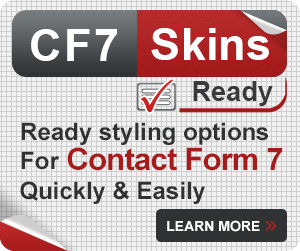 / FAQ / FAQs / How do I edit a CF7 Skins form (using Contact Form 7 editor)? 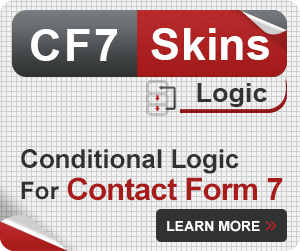 This FAQ is about using the Contact Form 7 tag editor. 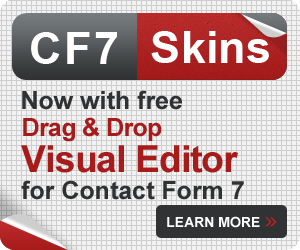 To edit your form on the CF7 Skins form tab (using the visual editor), see How do I edit my CF7 Skins form (using Visual Editor)? 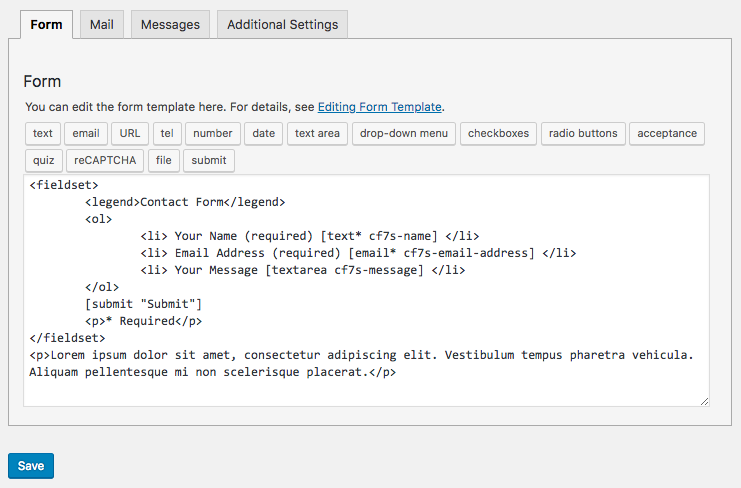 Selecting a CF7 Skins Template will change the HTML tags and Contact Form 7 tags shown in this editor. If you haven’t selected a Template yet, choose one that has fields closest to what you want in your finished form. 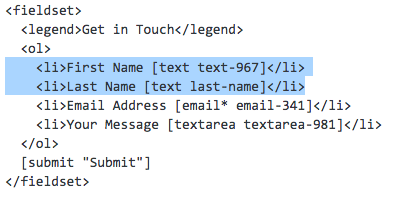 Tip: Each Template is like an easy to follow guide, which you can adjust by moving, adding, copying, and deleting fields. To edit the form, most people find copying, pasting, and deleting lines is the best way to make adjustments. Remove a field by highlighting the line and deleting it. Add a field by copying one that is similar, pasting it where you want, then editing the field name. For example, if there is a First Name row, you can copy and paste it then change the label to Last Name. 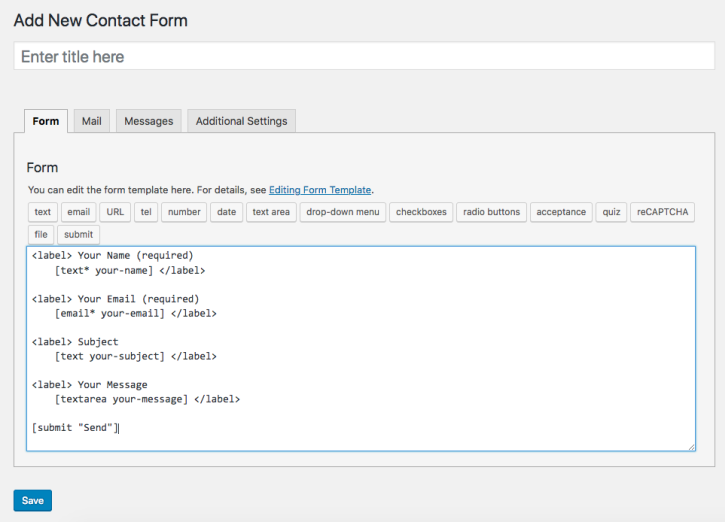 To add a brand new field tag, click a tag name from the tag generator button area just above your form editor. Insert it into your form, then copy and paste it into the correct position. 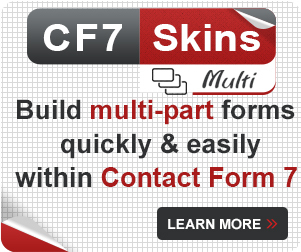 For a more in-depth tutorial, follow along with Edit your CF7 Skins Form (Contact Form 7 Editor). How do I find and select a Template? How do I save my CF7 Skin?